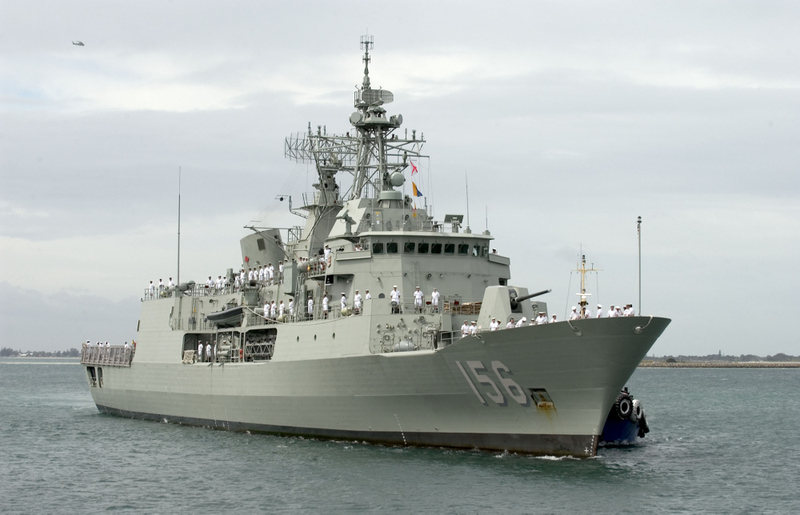 Participation in the weeks of intensive work-up training and assessment was a very demanding time for all onboard HMAS TOOWOOMBA, including myself. In a real attack, the Chaplain would be very busy giving comfort to the injured and attending to the dead and dying. Not being able to realistically exercise these ministries left me looking for other ways to ‘pull my weight’ whilst remaining free to attend to casualties. Nevertheless, the opportunity to integrate into the ship’s company, to become part of the team, was invaluable and by the time that we sailed on 4 January 2007 I felt a part of what seemed like a very friendly ship’s company. Soon after sailing, I commenced a weekly Bible Study with five or six officers and sailors regularly attending. In addition I started a nightly encouragement e-mail (short bible passage, reflection and prayer) which I sent to the ‘Toowoomba Fellowship Group’. This group started with nine and was to grow to 28 as I added names, including officers and sailors that I met on other coalition ships in the Gulf. Both of these activities were a blessing for myself and, I trust, others in the groups. Establishing a routine once we sailed was important. Each day I place into Daily Orders a ‘Chaplain’s Thought for the Day’ and historical items for ‘This day in the Navy’. Walking around the ship just to be available to the sailors and to continue to develop relationships was an important activity each day. Other regular activities included pastoral counselling, the need for which varied throughout the deployment, and presentation of material on life skills, the Muslim culture, and the emotional cycle of deployment either at Divisional meetings or in Daily Orders. Church was held in the sickbay twice a day every Sunday at sea. Serving on the lunch line in the galley was a pleasant activity that not only helped the cooks, but also provided another opportunity to talk to sailors. All of this kept me very busy and left little time to get bored. I always maintained that I never had ‘nothing to do’ – whenever there wasn’t something else to do, then I would get out to engage in ‘a ministry of presence’. Although not the healthiest place to be (passive smoking dangers) the ‘smoking pit’ was often the best place to get into conversation with the sailors. Our patrols were very much the same thing day after day for about three or more weeks without any break as we protected the oil platforms and conducted ship boardings. For most of the officers and sailors, the days were very tedious, and tiredness would set in with the long watches that they kept. Tiredness led to reduction in tolerance and so we had to constantly watch morale. The only things to break the monotony were the occasional replenishment at sea to top-up fuel, stores and fresh food. Most of the time, the sailors would be just looking forward to the next port visit, when they would have a chance to catch up on sleep and have a little fun. Many of them would book into hotels whenever they had leave while in port, so that they could enjoy some respite off the ship. It was interesting to see how the simple little things in life became so valued – things such as being able to shower for as long as you like, not having to wear thongs in the shower, and being able to sit in bed and watch TV. Mail was regularly received, either from the replenishment ship or by helicopter. Parcels from home were always received with joy and anticipation. Even though I did not really need anything, it was always exciting to receive a package to open. Whenever there was no package for someone, I would see the disappointment on their face. When in port, I would usually go to an Anglican Church service ashore. This gave me an opportunity to enjoy a full worship service and to receive some feeding for a change. I always met some interesting people, mainly British expatriates; and would learn something about the side of life kept hidden from the tourists. Some of the other ships in the area, particularly the US Coast Guard (USCG) cutters and some US Navy ships, did not have a chaplain onboard. So, on occasion, I would be transferred by the ‘Holy RHIB’ (rigid hull inflatable boat) to lead church services and provide pastoral care. These were always times of blessing for me. Just to get off the ship for ‘a drive in the country’ (as I called it) was a blessing in itself. Celebrating Easter in the middle of the Muslim world, and close to where the events actually occurred, was an awesome experience. One service on the focsle of a USCG cutter while surrounded by many local fishing dhows was, I thought, a great witness to the Muslim fishermen that Christians also take time to worship God and pray. Another service on the flight deck of a USN ship was also an experience that I will always treasure. The lay leaders had planned a great service with music and singing, including a very moving solo on the Easter events and singing of The Old Rugged Cross, which I led. Other memorable experiences were a Nias Memorial Service held on our upper deck just before sunset, and an Anzac Day Dawn Service held while alongside in Abu Dhabi. A question often asked is, “Who cares for the carer?” ie what ministry support is there for the chaplain at sea? It is really up to the individual chaplain to maintain his own spiritual health and growth. Internet connection, which might otherwise have provided opportunities to log onto church websites, was limited and very frustrating. I found that the Anglican ‘Daily Services’ in the Anglican Prayer Book were very helpful, as were daily devotional readings. Mutual pastoral care among all chaplains in the operational area is important. I always sought to establish e-mail contact with the other chaplains and whenever possible, while on patrol, I would visit other chaplains or host them onboard my ship. One of my most valued moments was an opportunity to read Morning Prayer together with a RN chaplain. On Toowoomba I was very much blessed by being well supported by my CO and the HODs, and I had a very cooperative cabin mate. On the other hand, a chaplain on another Coalition ship was inhibited in effectively carry out his ministry through having to share a cabin with an officer who would not willingly allow him to use the cabin and laptop. I believe that prayer support when in ministry is essential. I was blessed to be supported by faithful praying folk from three churches, as well as my immediate family. However I was inhibited in providing specific prayer requests because out-going e-mails were often stopped by the OPSEC (Operational Security) system and were then read before release. Nevertheless, I believe that the fact that this deployment has proven to be such a valuable experience, with so many blessings, is due very much to the prayer support of my ‘land based support group’.